Heat grill. Wrap tortillas in foil; set aside. In small bowl, combine soy sauce, lime juice and garlic; mix well. Thread beef, onion and bell pepper pieces onto four 8 to 10-inch metal skewers. Brush kabobs generously with soy sauce mixture. When ready to grill, place kabobs on gas grill over medium heat or on charcoal grill 4 to 6 inches from medium coals. Cook 7 to 10 minutes or until beef is of desired doneness, brushing frequently with soy sauce mixture. During last 5 minutes of cooking time, place tortilla packet on grill; heat until tortillas are warm, turning foil packet once. To serve, remove cooked beef and vegetables from skewers; cut beef into bite-sized pieces. 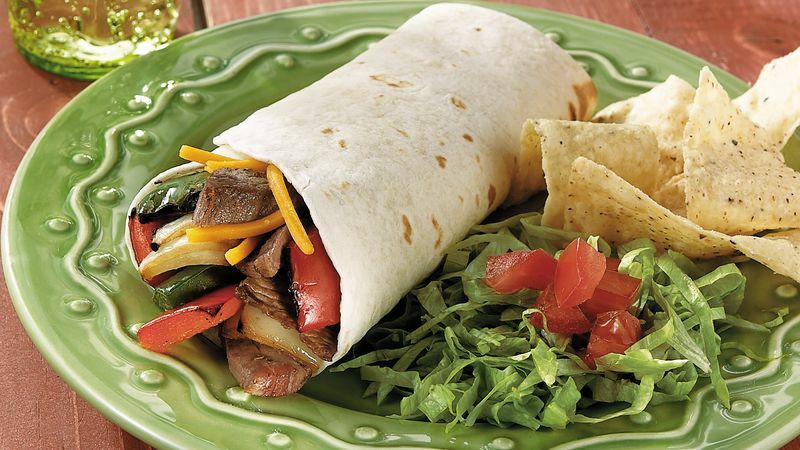 Serve beef and vegetables in warm tortillas. If desired, serve with cheese and sour cream. To broil kabobs, place on broiler pan; broil 4 to 6 inches from heat using times above as a guide, turning once. During last 5 minutes of cooking time, place tortilla packet on broiler pan to heat, turning once. Tortilla warmers - whether made of earthenware, plastic or sturdy foam - are great for entertaining. Heat tortillas as directed, then transfer them to the warmer for serving. For a fiesta buffet, let guests make their own roll-ups. Arrange grilled kabobs on a platter. Or, if you're serving a lot of guests, you can grill the kabob ingredients in a larger grill basket instead. Place hot tortillas in a warmer, or wrap them in a heated lined towel and place them in a pretty basket. Chips, salsa and margaritas complete the party menu.